The Burton Antler Flying V is a centered slightly different take on Custom Flying V. It’s a really fun good conditions ride but it loses a lot of its magic in harder snow. Conditions: Hard with some snowment in some places and in others soft packed powder with excellent morning groomers. Got a little chopped up at the end of the day in some places. Other days perfect soft Sierra snow. Perfect Rockies groomers in the morning leading to harder snow midday. 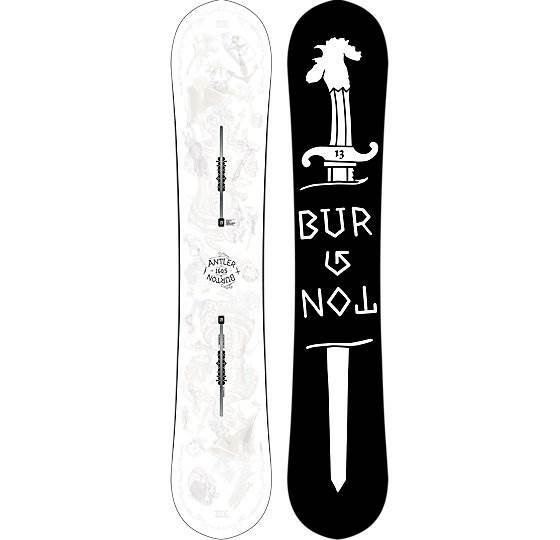 Bindings: Burton Cartel EST, Burton Diode Est, Burton Cartel Re:Flex, Burton Cartel Limited. The Burton Antler is marketed as a more aggressive Custom Flying V rocker with a centered stance and we can see that. It still had that playful buttery poppy consequence-free feel to it that can also handle a little more speed than the Custom Flying V and the Process Flying V. It reminded me a lot of the Rome Agent Rocker in shape and riding style but it feels less stiff, more playful and less stable. The Burton Antler was smoother and had a more lively feel underfoot and a little better pop. However, the Agent Rocker was more fun to carve, better at higher speeds and had better edge hold. The rest of the characteristics are very similar. On Snow Feel: The Burton Antler is the stiffest Flying V board in Burton’s line but it’s still a pretty soft loose playful board underfoot for those that weigh more like a typical American. If you run on the lighter side it will feel more aggressive but this is from a 175 lbs plus weight group. It feels like there is a lot of rocker underfoot so it kind of cancels out the very mellow camber near the tip and tail. I say near because the camber doesn’t extend to the tip/tail but stops before and then more rocker happens before the tip/tail. One footing and flat basing are loose and the all-around ride says its playful. You can butter around the mountain rather well but our favorite part about this board was the poppy forgiving nature when finding any minuscule bump to spring into the air off. So it’s a loose between the foot kind of all mountain board. Powder: You can tell the Burton Antler is about as fun as a twin like a board with a centered stance can get in powder. The extra bend up in the hybrid rocker shape from Burton makes for a very good ride. It’s no powder specific board but it’s got a lot of float for a board with a centered stance. There are many directional camber boards that have a set back with the same rating of good but the ride is completely different. This is floaty and effortless where the Camber is a lot more work off the back foot. If this had a set back of -20 mm it would be an incredible directional powder board and I’m surprised it didn’t at least have a -12.5mm set back like the Burton Custom Flying V. These days it just seems weird to have a directional shape that has a centered stance. Even though it’s the twinish side of directional I’d rather see it set back for easier directional powder riding. Especially because the channel system will allow you to easily center the board when you aren’t in the deep stuff. Turn Initiation and Carving: So the Burton Antler has a stiffer flex than all the hybrid rocker boards in the line but it’s still very easy edge to edge when making turns. Short Radius turns are fun and snappy. As you lean in to make a wider radius turn you can feel the downward bend after the bindings in the board engage the snow but it’s not a super solid feel. When engaging into a carve the Burton Antler can do well but it can get a little washy. The Edge hold isn’t there to handle carving in all conditions and there isn’t much camber to help you spring out of a turn but it works well enough in good conditions. So it’s better than continuous rocker but not as good as many of the other hybrid rocker boards we have tried. Speed: The Burton Antler has a very fast base and picks up speed quickly. Despite the stiffer flex, there is still some chatter and it’s not an ideal bomber board for people of our weight as well as stronger lighter riders. It really comes out more in harder conditions and is less noticeable when it’s softer. It’s pretty loose between the feet so it doesn’t track well in long flat sections but the base does keep its speed. It prefers to be slightly on edge in long flat sections. Uneven Terrain: So the flex tech underfoot and the general flex of Burton’s boards offer something different and better when hitting rougher parts on the mountain. It handles slower uneven terrain very well and it’s got great shock absorption for the medium flex. We had no problem weaving in and out of the chopped up end of the day snow. Approximate Weight: This felt pretty light and Burton has some pretty light boards. Edge Hold: The Edge hold is better than most hybrid rocker boards in Burton’s line but Frost Bite edges just don’t have the grip that other side cuts out there do. We really wish Burton would do more here because with more edge hold this could be an exceptional all conditions ride. Instead, it’s only for those that ride in softer to medium conditions. As it hardens up it becomes a little sketchy and I’d rather not be on this board. Flex: This is pretty much the middle ground of medium but due to the hybrid rocker feel the Burton Antler has a softer easier feel to it. It’s pretty fun to butter around if you want to slow down and play on the mountain. It’s got a do anything flex. Switch: This is a Twin like Directional board with a centered stance so the shape is almost like a directional twin. There is a twin flex with a directional shape and it has a centered stance. This makes for an easy ride switch or regular but there is a difference. It’s not as bad as you think because the tip/tail stick up so much that its lack of contact with the snow doesn’t bring out the difference as much. Jibbing: There are better boards out there but if you are in a jibbing mood you can do it. We’d rather be on a Nug or Name Dropper but it works well enough. When you compare this to many of the Burton boards in the line it’s lacking because Burton has some really good Jib boards. If you compare it to other boards that have similar shapes and flexes it does a pretty good job. Pipe: The lack of edge hold makes this for a spring pipe board but it’s not that fun in the hard snow. Jumps: The Burton Antler is very poppy. We could generate our own air just about anywhere on the mountain and found this to be pretty springy. If you like to lap the jump course in the park you will have a good time as well. The twin flex and almost twin ride make it very easy to land regular or switch. It’s better than some directional twins despite the shape is not the same as the nose or tail. So I had to try this board with the Diode Hinge Tech Bindings and with Cartel Re:Flex Bindings. The board springs incredibly well with the hinge tech bindings but it’s still super poppy with the regular old re:flex bindings as well. The Rome Agent Rocker is one of the most poppy hybrid rocker boards we have come across and this is right there with it. It even feels easier and smoother. In summary, the Burton Antler is a typical Burton hybrid rocker board that shines brighter than almost any other board in its class on a good soft snow day but is near the bottom of its peer group when conditions harden up. If Burton gave the Antler more edge hold and a little more camber it would be hard for other boards of this type to compete. I wouldn’t even mind the chatter as much because most hybrid rocker boards do that. It would be an extraordinary all conditions ride. I also liked this better than the Sherlock and Custom Flying V. It could handle a thicker guy like me much better. Like the complaint with the Agent Rocker, I’d like to see this add a set back to go with its directional shape. We try to get as many images of the Burton Antler Flying V, but forgive us if they're not all there. I ride the 154.5 2016. The goodride review is pretty much spot on - only difference i would put this board in my favourite list above the Libtech TRS XC2 - i have both boards and i think the flex pattern and sidecut put this board that much further ahead. Yes the Antler should stay at home on hard snow and ice (and the TRS has the leg up on those days) but for my high-rockies terrain, this board does it all for me most days. So much fun in almost every situation. Ride it with Genesis bindings and Ion boots. I got a sweet deal on the original Antler 160.5 (stupid droolly face graphic). I bought this for my trip out to Tahoe this past January. There was no snow and it was 50 degrees out. I should have bought new hockey skates. I'm not dinging my rating, because I am blaming Mother Nature instead of Burton. Conditions didn't match this board's strong suits. Tons of pop, speed, and fun. Edge hold is brutal to non-existent in icy, hard snow. In good conditions this board will be a beast. So if you live out east steer clear, if you live in Utah buy two of them. The Antler is the best do-anything, ride-anywhere board I have ever been on. It loves to jump, spin, and generally go balls-to-the-wall. I use it on the mountain and in the backcountry. It's main weakness was a lack of edge-hold but I fixed that by sharpening the edges under my feet from 90 degrees to 88 degrees. Woke it up and now it holds a great edge even on ice. I ride a 157.5 with medium Burton Cartel ESTs and Forum Kickers.